In 1994, Lina Iemmolo had an idea: to make traditional Modican delicacies with the help of the ladies living in the women’s refuge Casa di accoglienza Don Puglisi, giving the women the opportunity to learn a trade making Lina’s sweets twice as good. Today, Lina Iemmolo is tired but happy. Her story starts with a young girl, who carried out an apprenticeship in a patisserie once she finished school. 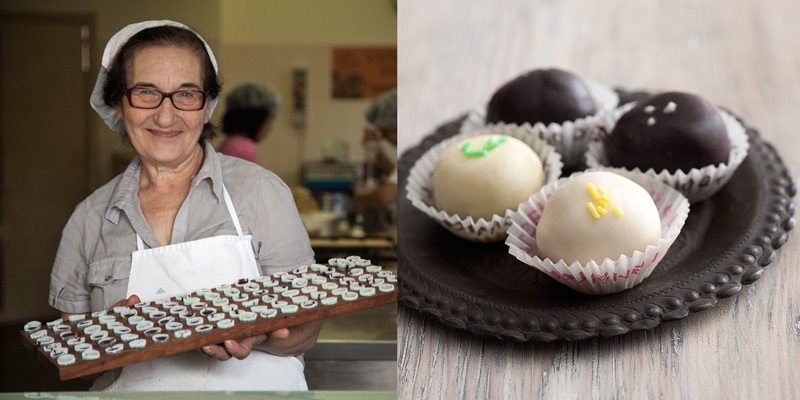 Lina learnt the art of Modican patisserie, which is one of the city’s crown jewels, together with chocolate making, which still uses the ancient Mexican technique of chocolate de pedra borrowed from their Spanish rulers, which is now known around the world as ‘Cioccolato di Modica’. In 1993, the confectioners where Lina was working closed. At the age of 44, being too young to retire but not having enough capital to start her own business, served as a source of inspiration for her. In Modica there was a the Don Puglisi women’s refuge, named after a priest from Palermo who was murdered by the Mafia. The house is a refuge for girls and young mothers who are in difficulty from all over the Sicily who are sent to there by social services. Lina had the idea of opening a patisserie shop inside the house. And so, in 1994 Lina’s dream slowly became a reality, and Laboratorio Casa Don Puglisi opened. Using their individual skills and knowledge, every woman in the house found their place within the organisation: some learnt the art of making traditional Modican pastries and sweets, whilst others were in charge of hand packing each carefully crafted chocolate. When they return home, the girls are proud at having learnt a trade. Of course in the beginning it was difficult to draw in customers because they didn’t have a glass shop front to draw in clients: but this didn’t discourage Lina, and along with the women in the shelter, they continued to make scrumptious sweet treats including: impanatiglie (traditional Modican sweets based on a mixture of meat and chocolate) which is a sweet pastry with a soft filling and snowflakes, almond paste biscuits which are as light as a cloud. Their pastries are little mouthfuls of pure joy, which we indulge in whilst Lina tells us about a tradition of the landlords of Modica: on festivities you always had to have something sweet to offer anyone who came to visit, and these pastries were perfect to keep in the cupboard for a while and offer to your visitors – hence their name dolcetti da risposto or ‘put-away’ pastries. Eventually, all the hard work started to pay off and they received international awards in London and tourists specifically get off the beaten track and make their way to the ‘new’ more spacious shop which was opened in 2008, and come in brandishing newspaper clippings, printed blog reviews and emails sent by friends who sent them there, excited at having found one of Modica’s gastronomic havens. Girls, they are as good as the ones that Lina makes. Upon the return of boss, we told Lina about our wonderful experience and she responded with a mixture of pride and surprise: “Of course the girls have mastered the skills. If not, everything we have done would have been a waste”, and this, this why Lina’s delicacies are twice as nice.